St. Bethlehem Animal Clinic understands that the success of our veterinary hospital is deeply connected to the success of the communities we serve. 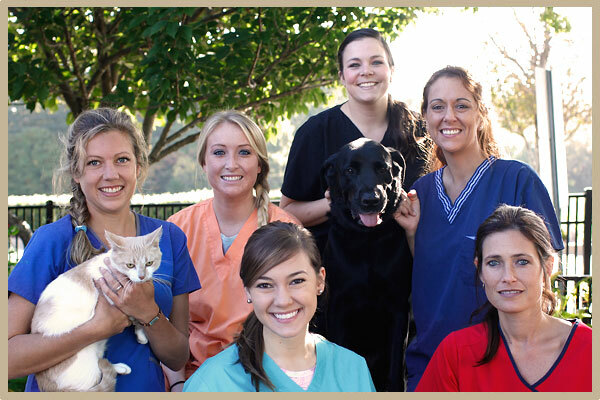 We all live in and around Clarksville, Tennessee, and take every opportunity to help strengthen our shared home by sharing our veterinary skills and being involved in our local community civic organizations and churches. If the mission of a veterinary hospital is to save lives, then there is no greater example of this than our Love at First Sight Kitten Adoption Program. This program started after seeing the number of healthy and adorable kittens that were being euthanized in our local shelter for want of a home. We knew we could do more and today we routinely visit the animal shelter to transfer kittens scheduled for euthanasia to our practice. We examine them, bathe them, and treat them for intestinal parasites, ear mites, and fleas so they are ready to be adopted. When you walk into our reception area you will see these kittens playing happily as they wait for a client or visitor to provide them with a home. There is no fee for this adoption. The new owner is instructed to take the kitten home and give it a week to be sure they fit into the family well then we request they return to start the kitten pediatric wellness program. In one five week period we adopted out more than 70 kittens to good homes. St. Bethlehem also provides low cost spay/neuters for the animal shelter and other humane organization groups in Clarksville. We do this as a part of our contribution to eliminating the pet overpopulation problem as well as for the pets’ best health. Beyond our animal centered activities, we financially support various youth community sport activities such as softball and baseball. We also help support a 1,500 child orphanage in Russia and build a Habitat for Humanity House every year. Additionally, the clinic’s owner, Dr. Ronald Whitford, is an instrument-rated pilot with the Angel Flight, a nonprofit that helps arrange flights for any charitable or medical need. He is also chairman of the Clarksville-Montgomery County Airport Authority and the past chairman of the Clarksville-Montgomery County School System, which was voted state school board of the year for the 4 years he was chairman. St. Bethlehem Animal Clinic is proud of our efforts to help support our communities and the needs of area animals. For more information on all that we do, please give us a call and we would be more than happy to talk with you.